Christmas baking is at a feverish pace here at our Italian baking headquarters. We are baking fiends after Halloween leading all the way up to the week of Christmas. 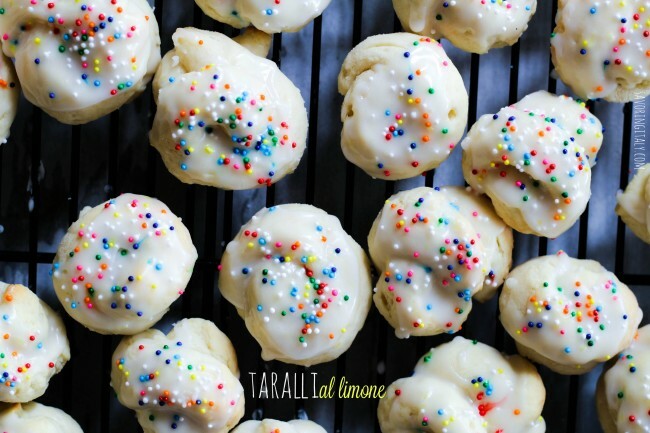 One cookie that is a staple in our home is taralli al limone, or Italian lemon knot cookies. You may know them as tarallucci or even anginetti. 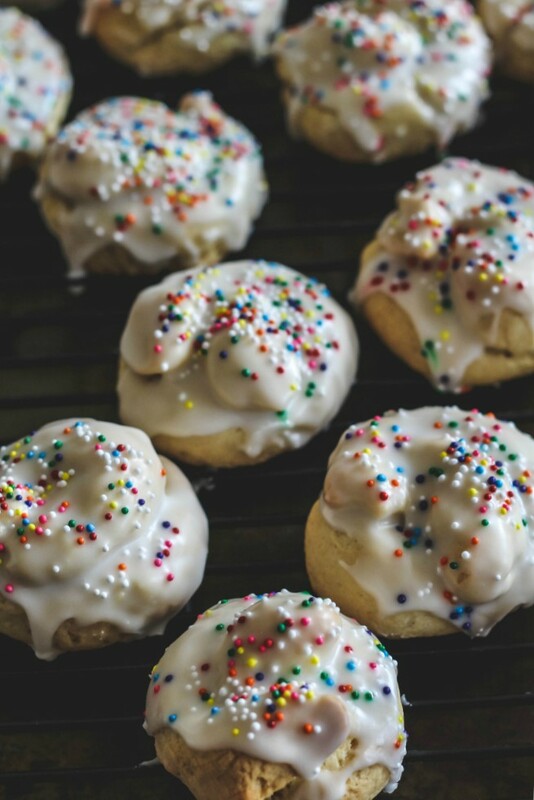 I remember having them as a little girl at various Italian friends’ houses during the holidays and have fond baking memories of making them as a young girl. 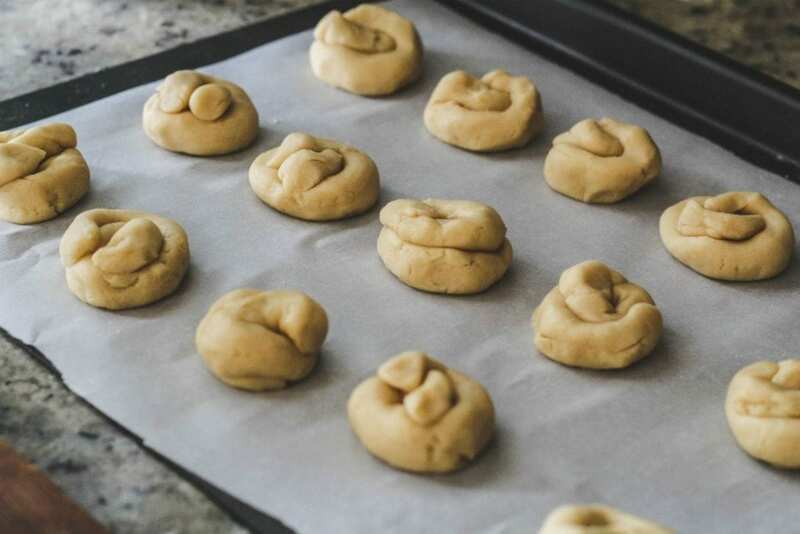 My mom and I would roll out the dough together into the little strands that would be shaped one after another into their familiar knotted shape. It didn’t matter if they weren’t perfect. And now my kids have learned how to bake them with me and with our friends that have Sicilian nonni (grandparents). Nonno Sal used to have a famous local pizzeria and was quite the bread baker and sauce maker. He is a calm teacher every year letting his grandkids make the dough by themselves and he taught them to roll out the strands and shape the little rings. Nonno Sal and his wife are from a small town near Palermo and they make a different shape than what I learned how to make. 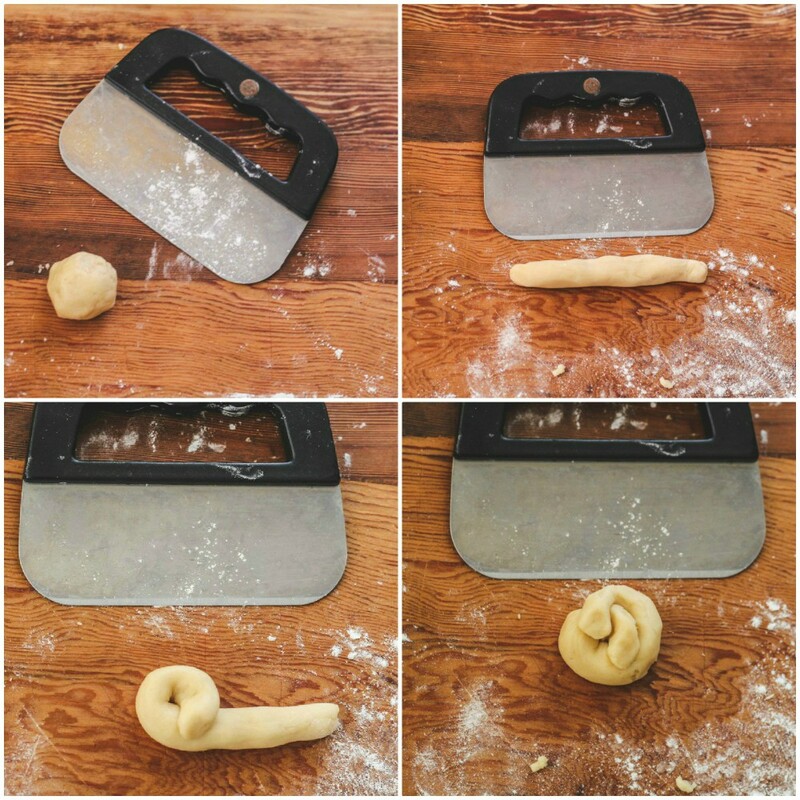 (See the photos below) Nonno Sal makes sometimes the criss-cross taralli instead of the small knotted shape. You could do it either way, although I prefer to make it like a round knot. 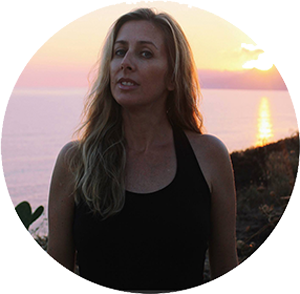 But maybe this simpler shape is easier to try out first with your kids or grandkids. 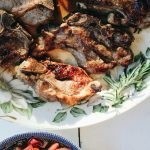 The recipe I’m sharing here is nonno Sal’s sister-in-law Maria’s recipe. I took a photo of the faded recipe and adapted it to my way of making it. Sal’s grandkids made their cookie dough a bit differently, as there weren’t really any true directions on the recipe. They mixed all the wet ingredients by hand and then mixed the flour in, eventually working the dough together on the clean tabletop by hand. I was curious how their dough would turn out, but the texture was fine. The only thing that wasn’t a hit with their batch was nonno Sal bought a pure lemon extract and added it to the lemon glaze. The flavor tasted a little off, even though he assured us by showing us the bottle that it was all natural. I make my cookies all the time with fresh lemon zest and juice. You can’t beat the flavor of fresh lemon juice. I like the dough to taste lemony as well and sometimes add the zest of 2 lemons to the dough (if I bought enough lemons). 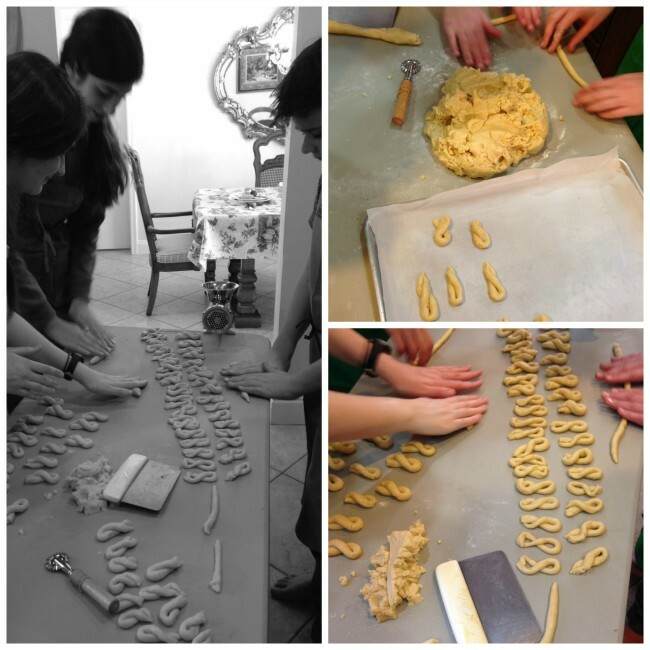 Taralli are baked in Italy during Easter in the Southern part of the peninsula. In Sicily, they are baked even at Christmas time. 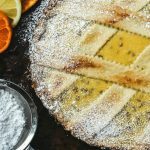 In Sicily you can find them in different provinces and they could be flavored with orange instead of lemon and also with anise. 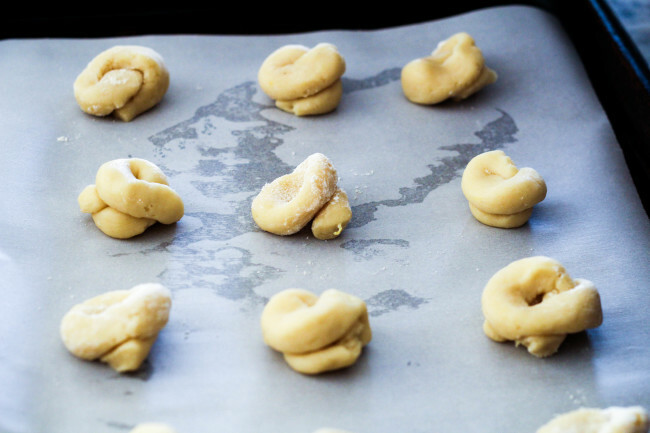 The taralli I have enjoyed in Sicily are made more like little ciambelle (little ring shapes)instead of knots. The last time I got to enjoy taralli in the winter time was 3 years ago exactly when my dad passed away. 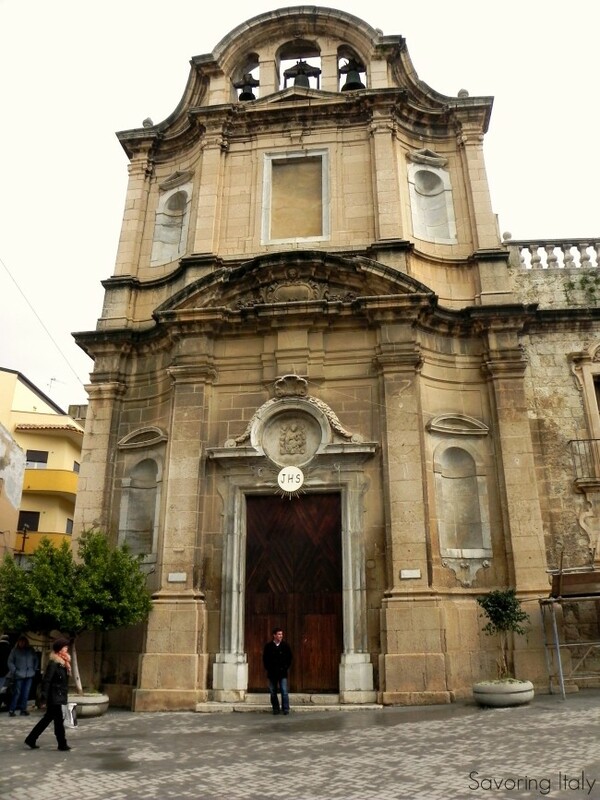 We buried my dad in his hometown in Sicily. My cousin Alessio would take us to all of the best pastry shops in his town and around his town and we would try every Sicilian cookie and pastry. 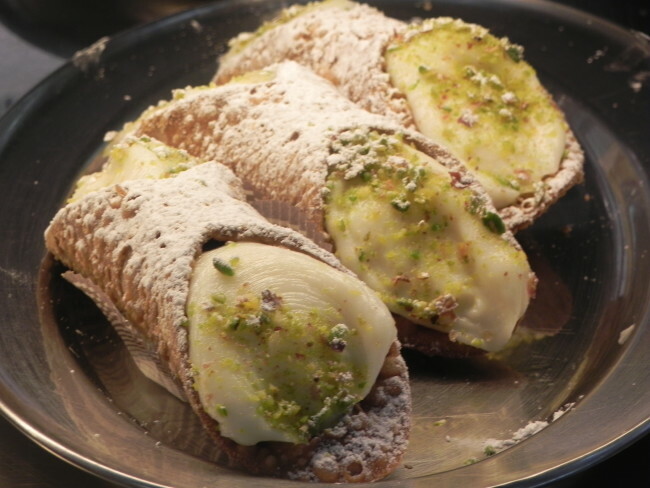 Here below are some of the amazing cannoli I had that January in Sicily when my father passed away. These were made with pistachios that are famous from Bronte, Sicily and sheep’s milk ricotta. Absolutely amazing. My cousin Rosario brought us a box of these cannoli when he came to visit us at my cousin’s house where we were staying. 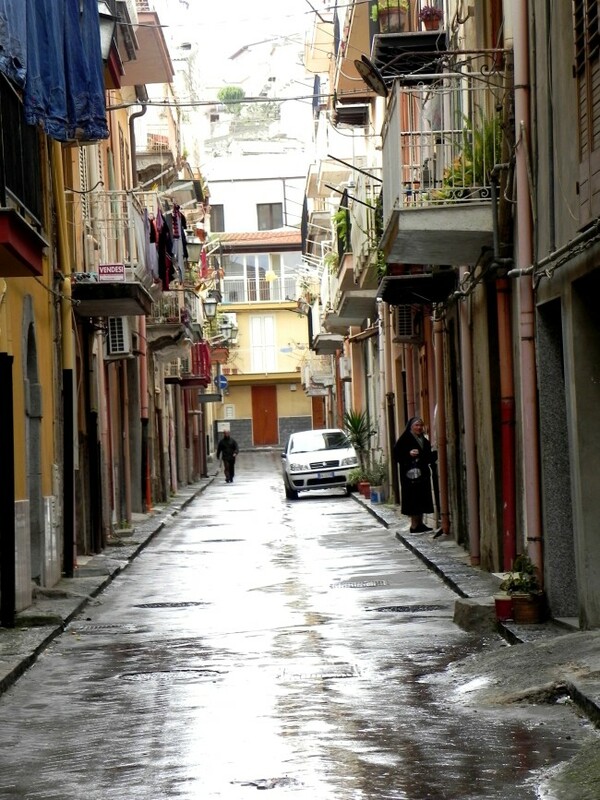 Various relatives passed by to visit us and pay respects and most of them arrived with typical Sicilian sweets. some notes on this recipe: The dough is super easy to put together. As I mentioned in the post, the kids even put it together by hand, without using a mixer. It doesn’t have any fancy steps and it is hard to mess it up. 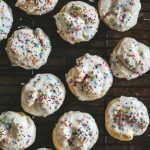 When the kids made the dough with their nonno, they didn’t even rest the dough in the fridge, they started baking the cookies right away and they turned out great! As for the lemon flavor, I like my cookies with more lemon flavor and even add lemon zest to the glaze. That is up to you if you want to add zest to the glaze. You can make it as lemony flavored as you like it, but be sure to use fresh lemon juice and if you can use organic for the zest, that is better. Photos and text updated from 1/2016. 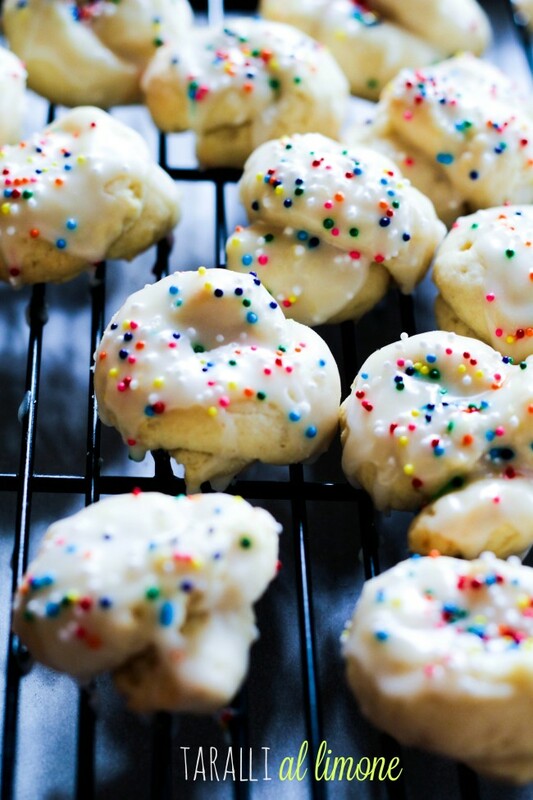 Typically made at Christmas, these Lemon Knot Cookies soft and full of lemon flavor. 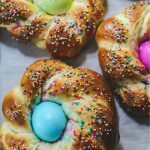 One of our favorite Italian cookies! In a medium mixing bowl, sift together the flour, baking powder and salt; set aside. In the bowl of a stand mixer, beat together the shortening and the sugar. Add the eggs one at a time; mix well. Beat in the milk and the juice of the lemon; mix well. Add the flour one cup at a time, stopping the mixer to scrape down the sides of the bowl and incorporate the flour. Line 3 baking trays with parchment paper and set aside. Scoop out dough a small portion at a time and roll dough to the length of your dough scraper (about 4-inch long). Shape into little rings (wrap one side over the other and tuck the ends under the bottom of the cookie). Place cookies spread apart on the sheets and bake for about 10-15 minutes, or until very lightly browned on the bottom. (every oven is different. Mine were done at about 13 minutes). 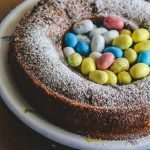 Lemon Glaze: In a small bowl, whisk together the confectioners’ sugar and lemon juice until it forms a thick but pourable glaze (add more lemon juice if necessary). If it gets too thin, add a little more confectioners' sugar. 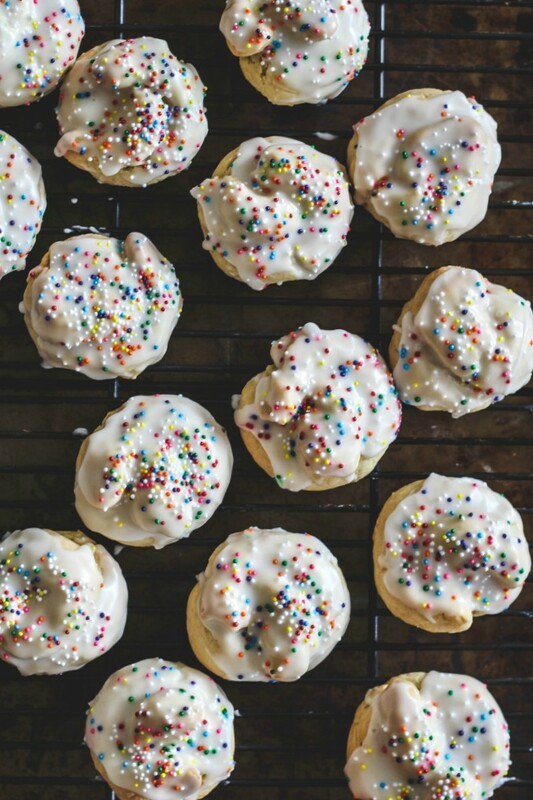 Drizzle on each cookie, add the sprinkles and let set, about 15 minutes. 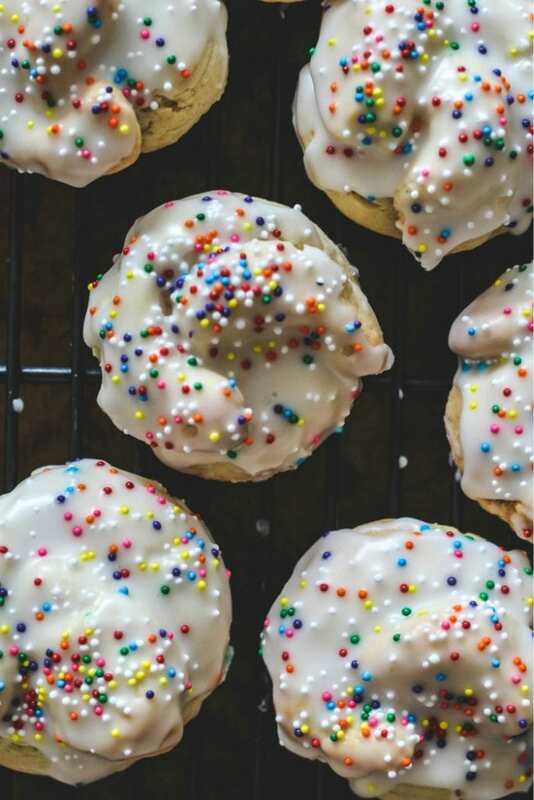 Glaze cookies with lemon glaze and sprinkles.